You may not think of Michigan when you think about an island vacation, but Mackinac Island is a great summer retreat. The island itself is a National Historic Landmark, and no cars are allowed. To get around the 3.8 square miles, you’ll need to use bikes, horses, or your own two feet. It’s a good thing you’ll be doing lots of physical activity, since Mackinac is famous for its locally produced fudge. There’s plenty to do on the island and in the surrounding waters. Take a shipwreck tour, go charter fishing, or hire a sailboat. On land, play one of the three golf courses, take a free guided tour of the Governor’s Summer Residence, or check out the natural wonders of Arch Rock, Devil’s Kitchen, and Skull Cave. 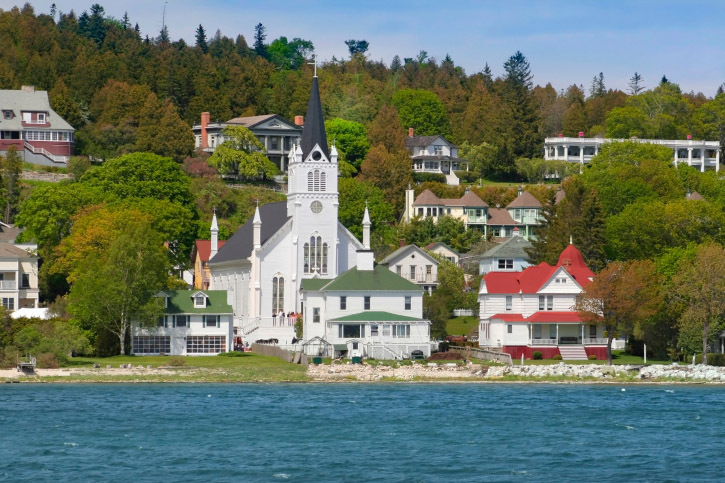 Don’t miss Mackinac Island State Park, the second oldest national park in America—free to visit! Where is it? In Michigan’s Lake Huron. Fly to nearby Pellson Regional Airport (check prices). Where to Stay? The Hotel Iroquois offers some of the best views of the Straits of Mackinac on the island, which you can enjoy on the property’s Circle Porch. What Else Should I Know? Shuttle services are available from a number of regional and international airports nearby. Who’s it For? Families, people who like fudge and hate cars.